What a fascinating card! This study in early 20th century greetings was among the postcard collection of my grandfather, Donald C. Minor, of Carmichaels, Pennsylvania. The print assembles several Easter symbols into a Victorian tableau. 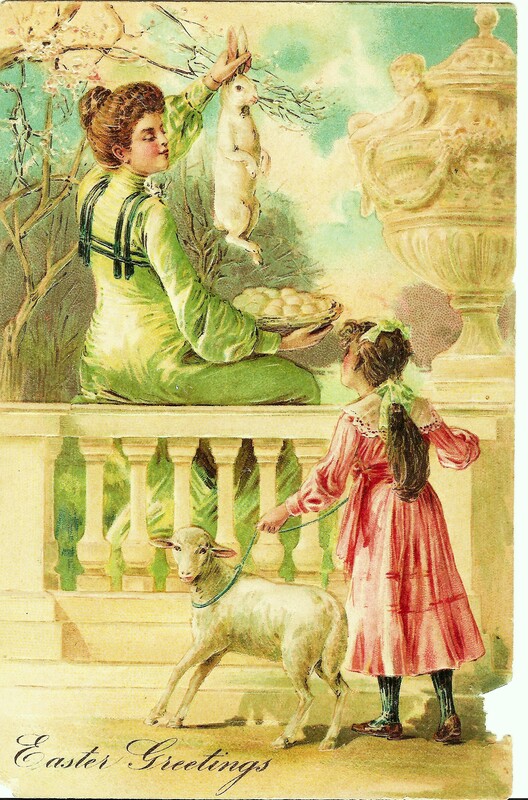 The young girl leads a Paschal lamb to a garden terrace. There a Victorian lady sits on a balustrade, holding a basket of eggs and a (very subdued) rabbit–both symbols of new life. The space is framed by an urn which depicts spring as a young child happily reclining and as a youthful face surrounded by the season’s bounty. Donald’s mother, May Laura Stephenson Minor, sent him the German card around 1910.